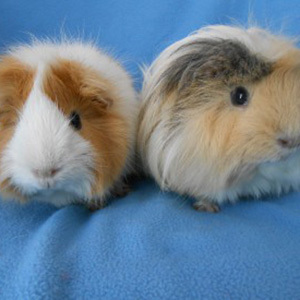 Chiquita and Bonita are sister therapy guinea pigs who were born in Wisconsin in 2011. As such, they are huge Packers fans! They are Peruvian/Abyssinian crosses. Chiquita (on right) means “little girl” and Bonita (on left) means “beautiful” in Spanish. These two gals are very social. Because of this, they’re well-suited to visit as a team at Children’s Hospital in Minneapolis. They also spend time visiting with at-risk teens and in various children’s programs at schools and libraries, including participating in the Reading Education Assistance Dogs (R.E.A.D.) program. Patti tells us in their off time Chiquita & Bonita love to play tag, especially through the tunnels they have in their special play area. They have favorite snacks too – including carrots, but nothing is a better treat than their weekly (well-deserved) orange slice.